This exercise continues to challenge the center of the body with the task of maintaining thoracic flexion while differentiating the movement of the legs from a strong and stable pelvis. To do this exercise you will need a mat. Start by lying on your back with your feet in a tabletop position and your hands clasped like a hammock behind your head. Inhale into the ribcage and then exhale as you narrow your ribs, press your ribcage into the ground and then lift your head, neck, and shoulders with the help of your hands. Inhale here keeping your head lifted and then exhale as you tap one toe on the ground and then let it rise back to the table top position. Inhale in between and then exhale as you tap the other toe. Repeat 8-10 times alternating sides and after your last inhale, exhale as you gently lower the head, neck, and shoulders back to the ground. If you have the diagnosis of osteoporosis you can modify this exercise by leaving your head on the ground and doing the toe taps with your pelvis on soft balls. 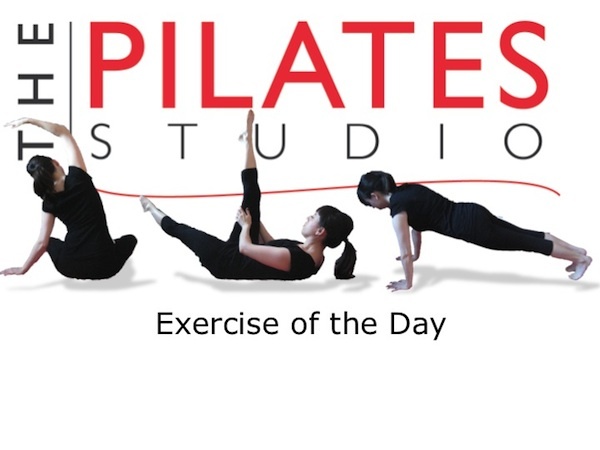 Using the breath correctly in this exercise allows the body to maintain an abdominal connection while continuing to exercise the lungs. Be sure to inhale into the back of the ribs and as always make sure that you get all of the air out of the lungs to really release the base of the ribcage to a stable place on the floor.